This Standard establishes minimum food protection and sanitation requirements for the materials, design, manufacture, construction, and performance of commercial refrigerators and freezers and their related components. 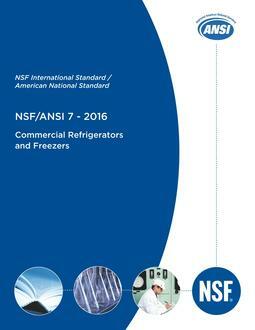 This Standard contains requirements for refrigerators and freezers used to store and/or display cold food. The types of refrigerators and freezers covered by this Standard include, but are not limited to: storage refrigerators (e.g., reach-in, under counter, walk-in, roll-in); storage freezers (e.g., reach-in, under counter, walk-in, roll-in); rapid pull-down refrigerators and freezers; refrigerated food transport cabinets; refrigerated buffet units; refrigerated food preparation units; display refrigerators; beverage coolers; and ice cream cabinets. This Standard does not establish equipment installation requirements. While the requirements of this Standard are intended to ensure that equipment may be installed in a sanitary manner, proper installation of equipment shall be governed by the applicable codes. Refrigerator and freezer components and materials covered under other NSF or NSF/ANSI Standards or Criteria shall also conform to the requirements therein. This Standard is not intended to restrict new unit design, provided that such design meets the minimum specifications described herein.